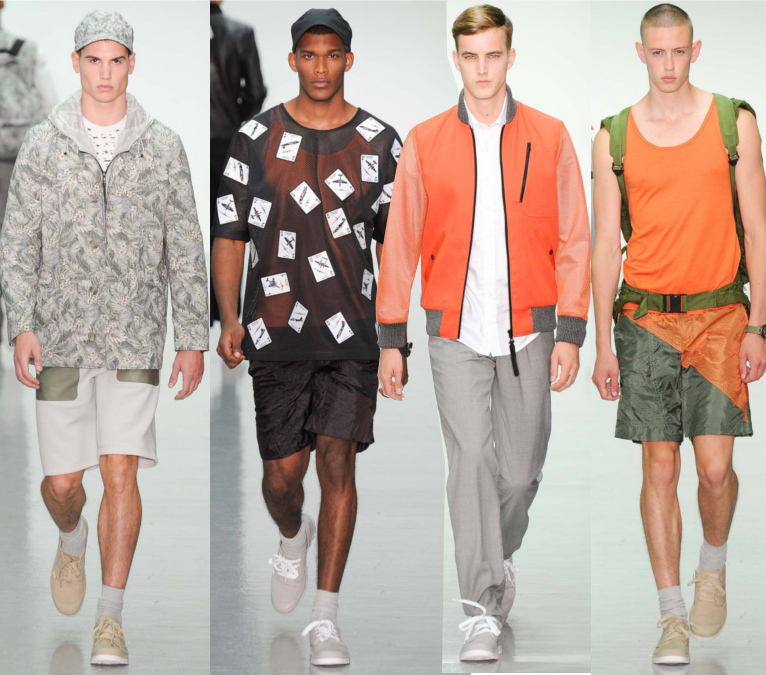 If there is one designer who deserves to be on the list of top London designers, it should be Christopher Raeburn. The clothes he presented for his new spring 2015 collection were simply one of the most powerful, sleek, and creatively done pieces of the season. He took the Desert Boneyard of Arizona – a place where many retired aircrafts are kept for storage – as his new survival theme. And instead of referencing it with militant uniforms, he took it to a modern and adventurous interpretation of sporty uniforms paired with backpacks that gave credibility of Mr. Raeburn’s capacity to design real ready-to-wear clothes. Desirable were his number of splendid lightweight outerwear jackets which have become a signature for this designer: a trendy floral print hoodie that was undeniably masculine; a leather bomber jacket engraved with different types of playing cards; a vivid orange perforated mesh-sleeved bomber; and nylon patched jackets worthy for those rainy days. The looks added a much youthful silhouette when paired with light gray pants or color-block shorts. This may have been quite the perfect collection that London should be looking for. The truth is Mr. Raeburn understands not every man dresses in suits and tie. Men need something casual yet luxe. And while he may have delivered an abundance of jackets for summer, the weather is never the same anywhere. Those leather patchwork sweatshirts and printed tees are sure to be an instant staple come next season. Mr. Raeburn knows where his comfort zone relies. Other designers also proposed something better for next summer. At Lou Dalton, the designer talked about how “this season has been about observation – taking a long hard look at who we are.” There was a soft structured tailoring present here. Intricate and minimalistic embroideries etched on suit jackets like an opening white camouflage look barely noticeable from a distance. Effortless were Ms. Dalton’s crisp white patchwork shirts paired with straight knee-length shorts and thick sole shoes in white. Even though some of those pale muted colors appeared to have taken some energy from this show, her keen mix of sharp sportswear and tailoring finally gave this collection some run for the money. If she keeps dissecting the identity of the brand like this, I can bet there will be more followers supporting her along the road. On the other hand, Richard Nicoll and DKNY seemed out of place in my opinion. There was a confusion coming from both of these brands. One appeared lacking tailoring skills while the other sent out the same type of overt styles. 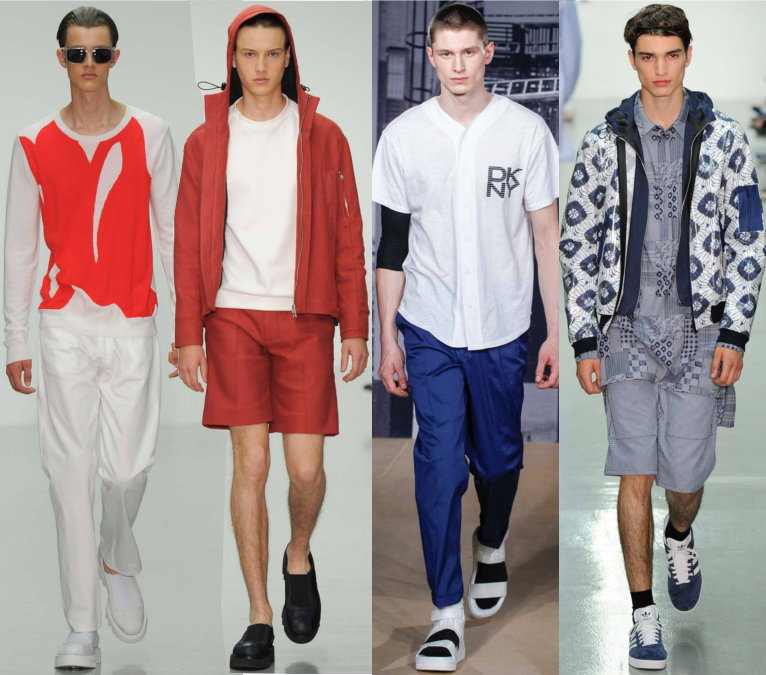 I didn’t understand what could have happen, but I can say I have more fate in Richard Nicoll like I did when it first made its men’s wear debut with a striking collection back in spring of 2013. At least one took some slighter risks. 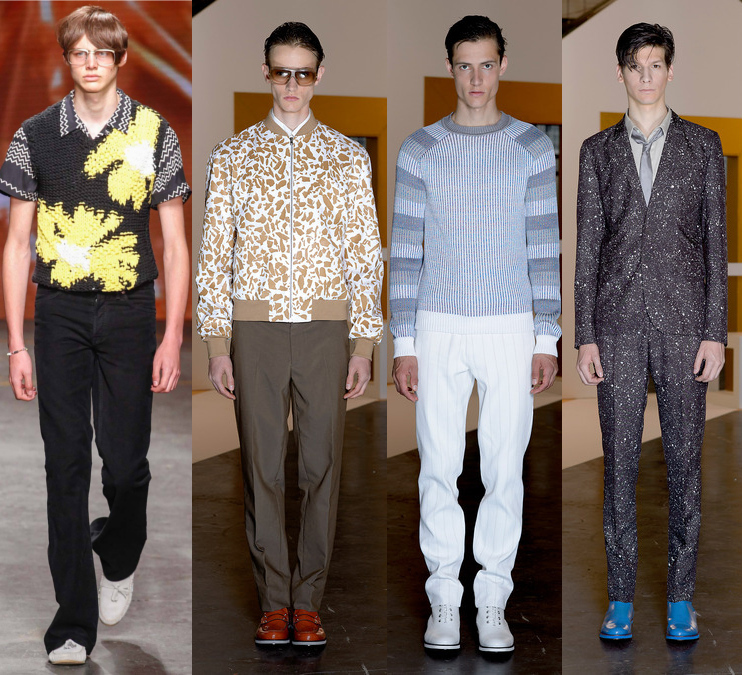 From a fashion point of view, Topman’s psychedelic use of prints and colors were a sensation. But forwarding to today’s society, this authentic and kitsch seventies looks were only made for the small number of guys who don’t give a damn about wearing pastel floral prints and flared pants. Too much perhaps? Maybe, but it sure brought a good entertainment to those of us who didn’t exist at that time. At least we know where to get our costumes now. Perhaps this is where Jonathan Saunders excels in giving English quirkiness a true polished look. It is no secret Mr. Saunders has an undeniable creative mind that tends to push the boundaries of being odd to super cool. And if there is one thing everyone should be familiar with this designer it should be his approach to high-tech patterns. To name just a few, one could find leather or metallic strips etched on shorts or jackets that resembled a cheetah pattern; a button-down shirt engraved with metallic pencil stripes; unique paint splattered suit ensembles; and pastel knits luxuriously crafted. Some of those colorful numbers of bold striped coats oozed cheerfulness. His male customers are undeniably going to have an outgoing wardrobe when summer arrives next year.